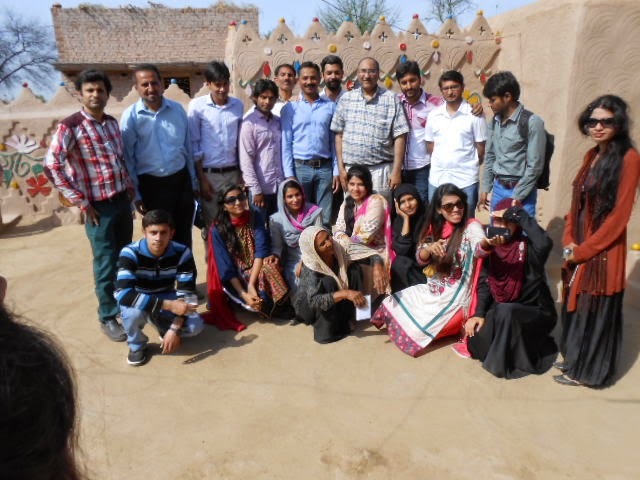 One of the most cherished Spring activity in the village Thatta Ghulamka Dhiroka is annual housing competition. This is an open competition and everyone in the village participates. Judges select the best mud house, best details and best exterior and cash prizes are given. This annual competition keeps the Dolls Village spanking round the year in addition to keeping the cultural morals alive. This year Winner Bibi Bashiran was the winner once again. 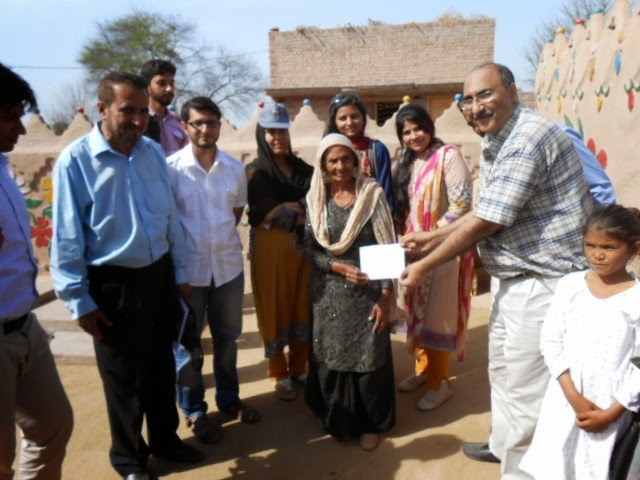 Professor Aamir Rafique gave the cash prize. 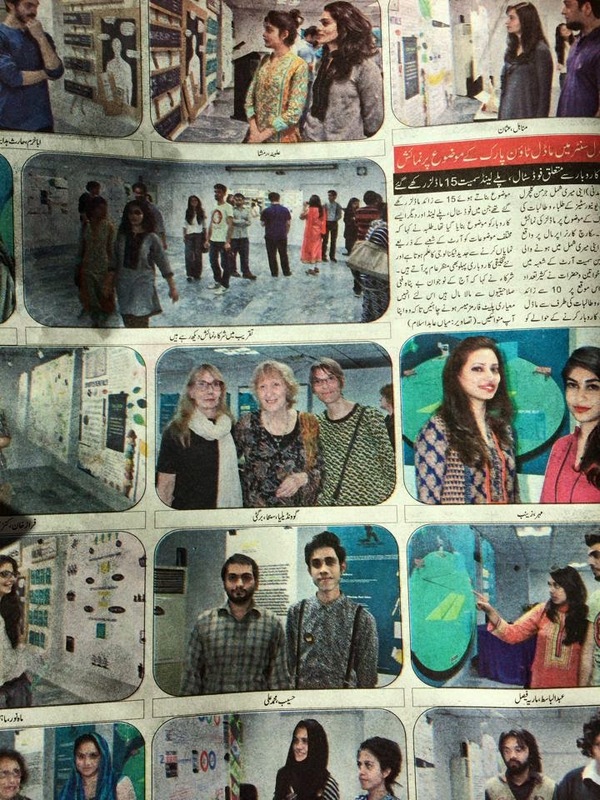 Compitition with aims of preservation of rural cultural, heritage and environment protection was supported by FPAC and SPARC in Lahore through students from Punjab University. The students were so impressed, that they have collected additional money for the winners. Is a future with further growth thinkable, plausible, imaginable,- or is it better to restrain oneself , and if yes, at the cost of whom would this happen. So are approximately the widely-separated opinions about the future. It is of course good and important to contemplate about the future. But this is quite difficult because there is no space available for understanding of realities. Clearly, the production of academic talent is industrial friendly and growth oriented. The parents desire a rosy future for their children. The magic word Education, as basis for a secured future, appears to be all popular for solution of all current and future problems. If everyone thinks and does in the similar way, it is of course positive, but it indicates how obscure time is. One almost feels like living in middle ages, about which it is claimed that religion replaced thinking at that time. If one could go into the time gone by, one would realize, that life then was quite normal. Analog to the present time is therefore valid: Education is the solution to all problems! The borders between belief and knowledge are always disputed! Fact is that what we know, we hear it so often repeated in the media, we tend to forget, that we actually know nothing. We believe a lot, but do not actually know it! Out of this situation, it does not make any sense to quarrel about more or less growth. The times cannot be pulled-back and the often praised capacity for prudence may sound very good but it does not appear to be realistic. The individual person moves through life on the strength of the thing called intelligence and always finds a reason for his deeds in order not to have any problems in justifying his position. The best criteria for reasonableness here is the measurable materiality, specially the financial magnitude. If it tends to increase, so is it -according to understanding of haves and have-nots-, a sign for correctness of their dealings. The discussion is further complicated by the belief in the concept of market which is supposed to regulate everything. A comparison according to Greek thinker Sophokles about the meaningfulness of democracy goes: it is imaginable in a collection of for example 200-300 persons! Globalization is nothing new. According to our ancestors, the political thought, understandable but not excusable, was accepted in multiple ways. There it now stands and the error in thinking has distributed itself over time in all possible areas. The instrument of stock exchange values is considered highly in the religion of economics. The memory of the human being is very limited and, similar to weather forecast, differences between theory and practices are quickly forgotten by majority of population, - for the contemplator, a special income generating measure, reason for new theories, which are then discussed in the society and time spend enjoyably. Violent disputes are unavoidable. The simple knowledge, that material and immaterial growth must come from somewhere, appears to be too much to understand. The stock exchange prices represent the economy but not the burden, on which the progress and the growth is built. Capabilities are evaluated in relevance to business, which can only work, if their elements are recognized by the selected few and utilized appropriately. The unrecognized value is not captured at all. Were this done, so would the calculated progress of the captured value of the taken-away put in comparison to that, what the producers and doers are doing and make them understand the contradiction and senselessness of their actions. Then what remains? – What is logical? – How should one proceed? There is absolutely no reason to worry! Most logical is, not to stop, rather let the growth take its course, because only catastrophes can shatter the belief. And, one must consider things long-term, for which the model of a Closed System is very helpful; as a closed system, we may use the example of a spaceship, which moves over a long period from A to B. material values here do not play any role! A big house, a new car, a yard, new clothing, etc, these values are not important. Reference to Utopia may occur, but they changes nothing in the existing reality, which now gives hope and creates new chances and possibilities, limiting repetitive discussions between growth and un-growth. Dr Norbert Pintsch, senior expert from SES, Germany is back in Pakistan for the spring. He has a lot up his sleeves that will unfold in this space as it happens. 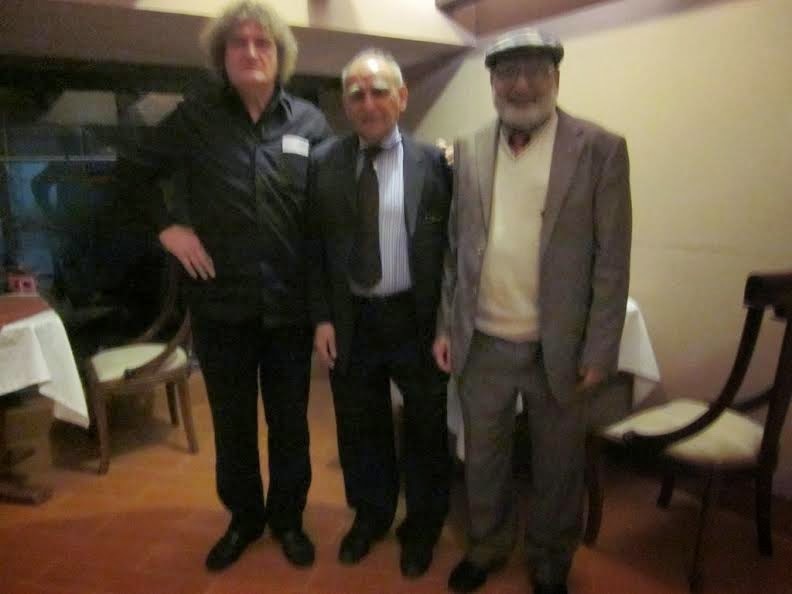 To start with, he had his first meeting with Prof Dr Malik - Hydrogeologist from COMSATS / IPC and Dr Saeed M. Chaudhry - President of DPF to discuss and have discussed the new possibilities of Appropriate Technology and chances of traditional medicine,including clean drinking water in mountain areas. This discussion is part of greater cooperation between AFA (NGO of Thatta Ghulamka Dheroka) and AFWA (NGO in rural area in the vicinity of Islamabad).